Can anyone provide the part number for an 08+ XB9 flywheel assembly? I don't have it with me . . but if no one pops up with it I have every Buell manual at home and would be pleased to look it up. I'll be home by Wednesday. Might want to wait for Court, but by my interpretation the flywheel/con rod assembly is 24234-08. At least that's for a Lightning City X which I thought was a 984 cc. Maybe try that number on a google search? And the 08+ crank won't go in 07 or earlier cases without machine work on the cases. I know that's true for the 12's and suspect it is true of the 9's as well. Put a '08 flywheel assembly in my '07 Uly. Don't remember having to machine the cases. Does need some different parts though. I thought one journal (forget which side) was bigger on the 08 and up. Maybe it's a bearing change, not machining. Somebody here did it, can't remember who. From what I understand, Just need new races and bearings for the swap. Excellent! I stand corrected, I was remembering wrong. Other than the rotor, primary chain and retention bolt, is there a spacer needed between the rotor and the stator? I've not been able to find this information. 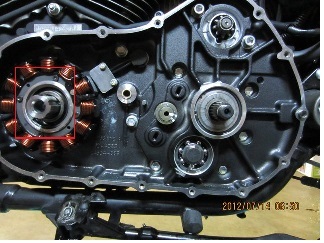 The spacer is also the surface that the oil seal rides on. Supposedly one size fits all, P/N 40254-02. Of course, if you pull that out I think you're supposed to also change the seal and snap ring which looks like a daunting task judging by the service manual. So this spacer goes on the shaft before putting the primary rotor on? I don't have an 08 book to look at... just on 03. I want to make sure I'm not missing a piece between the rotor and this. At first glance it seems nothing goes here. I just want to be certain. It looks like something is there, photo kinda small. If the inside of the seal is not exposed then it's there. Don't pull that out, must install new seal, snap ring and spacer if you do. I don't see the shift lever assy. either. Be sure that's on too.